A printable CD or DVD takes media to a higher level of creativity and customization! These discs are designed with a printable surface area to display artwork without interfering with the function of a disc. These are available in a variety of formats to suit the needs of specific printers, as well as to suit an artistic vision. CD-R is the most popular format of available printable CDs. Less frequently CD-RW’s are also available on the market. Inkjet printable CDs use the same concepts as inkjet printers and paper. 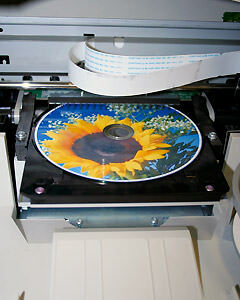 A compatible printer will recreate images and text through sprays of ink marked on to a corresponding CD surface. These surfaces may be white or silver in color. The inked image is subsequently coated with a protective lacquer to achieve waterproof, smudge-proof and smear-proof results. Inkjet printable CDs deliver images, text, and graphics of superior quality without breaking the bank. However, a disadvantage of this type of disc is that it often takes longer to print than thermal options. A thermal printable CD merges heat and pressure so that text, simple line art, and some small images can adhere to the surface of the disc. Heat-sensitive ribbon or paper rests between the disc and the print head. It is difficult for thermal printing to recreate photo-realistic images. However, thermal re-transfer printing puts high resolution images from an ink ribbon to a transfer film and through an electrostatic procedure, holds fast to the surface of the disc. The re-transfer process preserves the high-resolution image. Many disc surfaces are coated with a lacquer that makes them more conducive to thermal printing and are designed to prevent smudging.